TAICHUNG CITY STADIUM. Japan is the first team to reach the Gold Medal Game at the XXVI 18U Baseball World Cup in Taichung. With one game left on the semi-final round robin schedule they already have secured one of the two spots in the finals. On Friday evening they dismantled record title holder 10-0 in eight innings at Taichung City Stadium. It was their seventh win in as many games. Cuba dropped to 2-2 in the semi-final round before their final matchup against Venezuela on Saturday. It was an impressive statement by Team Japan on Friday. 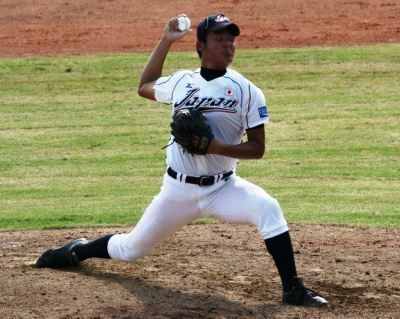 While high school pitching star Tomohiro Anraku stifled the Cuban bats with ten strikeouts in eight scoreless six-hit innings, their offense didn’t have any problems to score against the Caribbeans. They took an early 1-0 lead in the second inning thanks to a RBI single by Nobuyuki Okumura, who drove in Yasuhito Uchido (reached on error) with two outs. In the fourth Ryo Watanabe converted an eight-pitch at-bat into a two-run home run and Takahiro Kumagai tripled home another run in the fifth to make it 4-0. While the four-run advantage already would have been enough to beat Cuba thanks to Anraku’s pitching, they tagged on six more runs in the eighth to end the game via ten-run rule. Satoshi Sonobe and Seiji Uebayashi highlighted the big rally with a two-run double and a two-run triple. Cuba meanwhile had its best opportunity to put runs on the board right in the first with two runners in scoring position and one out. But Yanio Perez and Luis Robert struck out and grounded out to first to end the frame. On Saturday Cuba will face Venezuela in the afternoon game at Taichung City Stadium, while Japan will clash with the United States in the evening affair at Intercontinental Stadium. QUIROZ faced 1 batter in the 6th. CONRADO faced 3 batters in the 8th.